Plants combat their enemies with potions, charms, and tricks, and Jeff Dangl is watching. Soft rot. Fire blight. Stem canker. Leaf spot. These plant diseases are caused by bacteria that don’t infect people, says biologist Jeff Dangl. But that doesn’t mean we’re off the hook. Nearly 30 percent of the world’s harvest is lost to disease each year, and reliance on pesticides is not diminishing. Protecting our most important food crops — such as corn, wheat, and soy — is also an issue of biosecurity. But when plants are teeming with millions of bacteria, both good and bad, how do they know which microorganisms to fight? Dangl admits that chance played a big role in his decision to study the immune systems of plants. He began his science career as an undergrad at Stanford University. Leonard Herzenberg, a celebrated immunologist, put Dangl to work at a summer job. He ended up staying for grad school. “I owe an incredible debt to the Herzenberg lab,” Dangl says. “They allowed me to see what science is like when it’s practiced with joy and dedication and creativity.” By the time he finished, Dangl had become a dedicated immunologist himself, interested in how living things recognize pathogens and protect themselves from disease. Toward the end of his graduate work, he went on what turned out to be a fateful errand: to the library to find an article. “The journal I held literally fell open to a paper on defense response in plants to microbial infection,” he says. The paper described the work of Klaus Hahlbrock, who showed that when plants encounter a pathogenic fungus, they turn on genes required to fight the infection within minutes. The response is fast — faster than scientists expected. Soon after reading the paper, Dangl sent Hahlbrock a letter and asked for a postdoctoral job. He joined the lab just as it was moving to the Max Planck Institute in Cologne, Germany. Dangl’s postdoc with Hahlbrook then morphed into a position as an independent-research-group leader at the neighboring Max Delbrueck Institute. 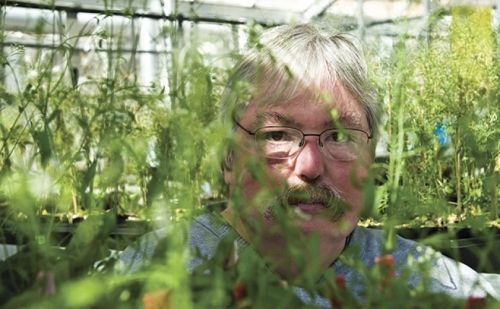 Dangl’s position was well-funded, and he was given the freedom to explore risky new ideas in plant genetics. At that time, in the late 1980s, scientists were just beginning to work out the genes involved in plant recognition of pathogens. Science funding during this period was hard to come by in the States. “In Cologne, we had the luxury of reliable money and were able to do pretty far-reaching stuff we wouldn’t have been able to get funded for in the U.S.,” Dangl explains. One of Dangl’s forward-thinking projects was developing Arabidopsis thaliana, a weed known as thale cress, into a model for plant immunology. Arabidopsis had been a staple of scientific research because of its small and malleable genome, so lots of tools were available for manipulating the biology of thale cress. But Dangl was among the first to use those tools to study how plants respond to pathogens. Unlike animal cells, plant cells have thick walls made of cellulose that are nearly impossible for germs to penetrate. But millions of years of evolution have provided plant bacterial pathogens with a unique tool: the type III secretion system, a deadly needlelike device built from around twenty different proteins. Laser confocal microscope image by Erica Washington; ©2008 Endeavors. 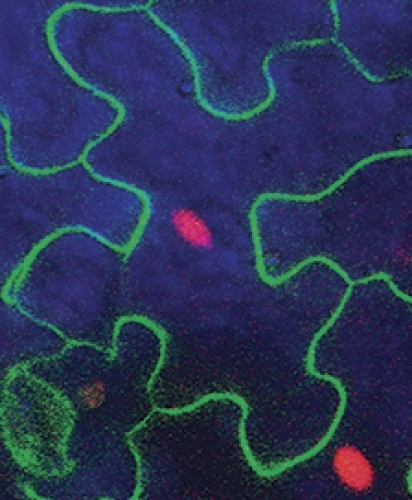 A pathogenic bacterial protein was injected into these epidermal plant cells and redirected to the cell membranes (green). The larger red spots are the nuclei of the plant cells. Click to read photo caption. Laser confocal microscope image by Erica Washington; ©2008 Endeavors. Once a type III needle punctures the cellulose wall, the pathogen can inject proteins directly into the plant cell. These injected proteins are called effectors. They turn off the plant’s antibacterial defense mechanisms and can cause nutrients to leak out of the plant’s cells. This triggers a disastrous chain reaction. New pathogens waiting outside the cells immediately feed on the released nutrients before finding and attacking new plant cells. While infection does not always mean death for the entire plant, the destruction of large leaf areas, for example, shuts down photosynthesis, weakening the plant and lowering its productivity. But because germs and plants have evolved together over millions of years, plants have had time to develop an arsenal against bacterial attack. Unlike people, plants don’t have immune cells that circulate throughout their bodies, surveying for signs of infection or disease. Instead, every plant cell must be ready to recognize pathogen infection and send signals to neighboring healthy cells, telling them to kill off the infected cells and bar nutrient flow in and out of the affected zones. The blocked-off cells will die along with the resident germs, but the rest of the plant will live. Plant biologists have thought that in order for this quarantine response to occur, an effector had to meet up directly with a corresponding plant resistance protein in the cell. This one-on-one interaction would then set off a cascade of molecular events that leads to death of the infected tissue. Scientists thought every effector had a disease-resistance-protein counterpart. Dangl’s lab was among the first to isolate these resistance proteins in plants, shortly after coming to Carolina in 1995. In a series of experiments published in 2002, 2003, and 2005, the Dangl lab was able to prove this hypothesis. In one example, the plant pathogen Pseudomonas syringae secretes an effector enzyme into the plant cell. This enzyme chews up several proteins, disrupting processes that might kill the bacteria. But when the enzyme breaks up a protein called RIN4, a specific plant disease resistance protein recognizes the damage and goes to work to prevent further destruction. Disease-resistance proteins in plants look a lot like proteins involved in human immune defenses, and are found in most animals from sea urchins on up. Dangl and others think that our “innate immunity” probably evolved soon after multicelled organisms appeared on Earth. Because this family of proteins looks the same in most species, Dangl argues that Arabidopsis is a good model organism for studying questions about diseases that directly affect humans. Following work done by the Dangl lab and others, a French group found that a mutated form of a disease-resistance-like protein is partially to blame for Crohn’s disease, an illness that affects nearly 600,000 people in the United States and Canada. But let’s get back to plants. Plant breeders have known for centuries that if you cross a disease-resistant plant with a susceptible one, you can end up with offspring that are mostly resistant. But this process is messy. Many genes get transferred during the crossing, not just the ones that code for disease resistance. You might end up with a more disease-resistant tomato that is easy to grow, but it might not be as tasty or as pretty as the one that always gets sick. Dangl and plant genomicists around the globe are hard at work sequencing the genomes of plants and plant pathogens in hopes of identifying the disease-resistance genes of plants that humans rely on. Dangl asks, “What if you could take the disease-resistance gene of a wild tomato and drop it in an heirloom tomato, which are invariably disease susceptible?” Moving genes between different varieties of the same species might be a safe way to engineer plants that are disease-resistant and more tolerant of our changing climate. And it may let us cut back on the pesticides we use to grow fragile fruits and veggies. There are some nasty plant pathogens out there, but they are far outnumbered by the billions of beneficial microbes plants depend on for growth and health. Dangl says that the next big frontier in plant science will be deciphering the complex relationships among groups of beneficial bacteria and fungi. He and his colleagues are setting up an ultra-fast DNA-sequencing facility on campus that will be used to identify and study the microbial communities living on and around plants. Jessica McCann was a student who formerly contributed to Endeavors. Jeff Dangl is the John N. Couch Professor of Biology in the College of Arts and Sciences.